I've seen quite a few post's lately about what our Christmas wishes are. Right now I am truly wishing that my job holds out! But, what I would LOVE to have is a Louis Vuitton bag..............You all know how frugal I am and I would never even consider a bag that would cost the same or more as my mortgage payment.. But, this is the season for dreaming!!!!!!!!!! If anybody would like to pick me for their secret Santa friend and send me one I'll be happy to pay the shipping! I recently acquired Photoshop and have been learning and practicing. Since I couldn't think of anybody else that would care that I am learning this new program I thought I would share it with my bloggy buddies. 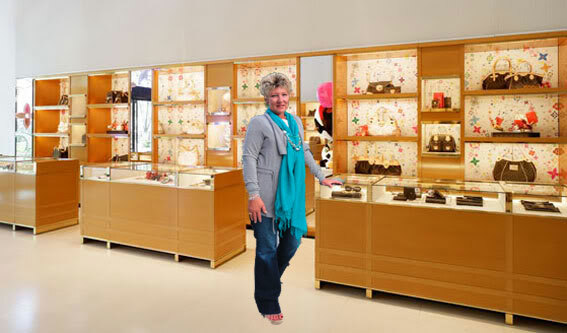 So here is a picture of me enjoying a dream shopping trip at a Louis Vuitton store. The picture was actually taken on my back deck and inserted into a picture of the store. Poop, I forgot I could have made myself skinny! Oh, well somethings aren't worth the effort! Maybe next time! I think I'm going to have fun with this program. You might find me in all sorts of interesting places! It'll be like wheres Waldo but instead of Waldo it will be me! Don't forget to link up to Trending Through the Decades: Fur...Faux Real??? It's a fun link up where you can show how you style a current trend in your age decade. You did an awesome job on the photoshopping. I tried that technique a few times and it just never worked out for me. And I thought it would be so cool. Good luck on that handbag! So...dreaming.... I'll take a vacation to some place sunny and warm, please. For Christmas I'm wishing that your job holds out and that I can find one! This picture is so much fun! Hope you'll come by and enter my Christmas giveaway! Hey Tammy! Thanks for visiting back to my blog! I am still intending to join in the furry link up but I havn't quite got around to include furry things in outfit photo despite the fact I hvae been donning fur! I've got some old photos thpugh? Is that ok? Well done on Photoshop- I keep meaning to try and find an editting program! LOL! I would have never know that you had photoshopped yourself in if you hadn't of told us! Great job! A Chanel suit. Second hand would do! Have you seen my experiemtns with photoshop lately? We'll have to dish! Its a little hard to learn, no? I would love to have Photoshop, but all I have to use is Picnik. It has some cool features, but nothing like photoshop. There are some of the LV bags I like, some not so much. Some really expensive bags are really heavy and not too practical. I have a couple of bags that are so heavy with nothing in them that they are a real pain in the back. I think some of the fun in wanting something is in the wanting it rather than the having it, as I experienced with my boots. I dreamed that I would be so cool wearing them and the boots did not make me cool. i love writing a christmas list! i totally get the whole LV bag obsession and i hope you get one :) that would be nice...or maybe kinda naughty!